If you’re out of your depth when shopping for the men in your life, it can be tempting to fall back on the classics of socks, beer or a novelty tie. For some, those gifts will be exactly what they want this Christmas, and quite frankly we're jealous if that's your husband, boyfriend, son, brother or friend. If, however, you’re looking for something a little more personal, or something that matches their interests, be that technology, DIY or fitness, we’ve done the hard work and whittled down the options to a list of 11. Our gift list is designed to be friendly for all budgets, featuring sneakers and DIY gadgets, as well as one of highest spec Bluetooth speakers you can buy today. Where we’ve included the best of the best we’ve also included a handy link to our more thorough buying guides where you will find a cheaper alternative. Ready to ace your present-buying for him this Christmas? Take a look at our hand-picked list of the best gifts for him. The ideal gift for adventurers, GoPro’s top action camera has been upgraded and it's better than ever thanks to the new, improved Hyper Smooth Stabilisation. Every second of your man’s adrenaline-fuelled antics, whether he’s hammering down mountain bike trails with mates or enjoying pool time with the kids during the family holiday, will look like they were recorded using a gimbal. Not only will he not need a gimbal, he won't even need hands thanks to the voice control features of the Hero7. Simple say one of 14 commands, including "GoPro, take a photo," and immortalise the action forever. If you know a thing or two about action cameras yourself you’ll know GoPro are the go-to brand that the competition just can’t compete with. If you aren’t so familiar with camera specs then here’s what you need to know: this camera will take stunning 12MP photos and capture video in 4K/60fps top resolution. That’s incredibly high spec, and will give his footage a pro sheen. Plus there's the new local tone mapping that will adapt the colouring of his photos in any light to bring them to life. Lastly, slow-mo shots on the Hero 7 are better than ever thanks to a 1080p/240fps setting coupled with advanced digital image stabilisation. While the Garmin Forerunner 235 didn't make the top of our best running watch list – that honour fell to its older sibling the Forerunner 645 – this is the best value running watch out there. What’s so smart about this smart watch? Like many running watches, the 235 features built-in heart rate monitoring and will track his speed, distance and cadence (stride rate) during a run. Where it excels is how it can make suggestions based on its wearers activity and fitness level when used in sync with the Garmin app. For starters, it suggests recovery times and how long it should take him to run 5K, 10K or a marathon. While newer models can hold more, the 235 will still store up to 200 hours worth of activity, and last for approximately 11 hours when using the GPS tracking, which we suggest is a week’s worth of use on average. If you’re looking for a high-end product that does the job but doesn’t break the bank then the Garmin Forerunner is the best choice. If he’s already a pro runner and would appreciate more insight from a watch with a built in music player, you can opt for the newer Garmin Forerunner 645, which is quite simply the best premium running watch you can buy today. With more and more of us opting to wear running watches every day, there’s never been a better time to treat him to a super stylish dress watch for evenings and special occasions. A traditional analogue watch with a sleek, timeless design, this watch will suit any man and any outfit. The face is stainless steel with silver dial and the fourteen strap options include black or brown leather, or stainless steel (pictured). This watch is all about timeless style, and so tech specs are low. The face displays the date and is water resistant up to 50 metres, which is pretty impressive given that it is not a smart watch. 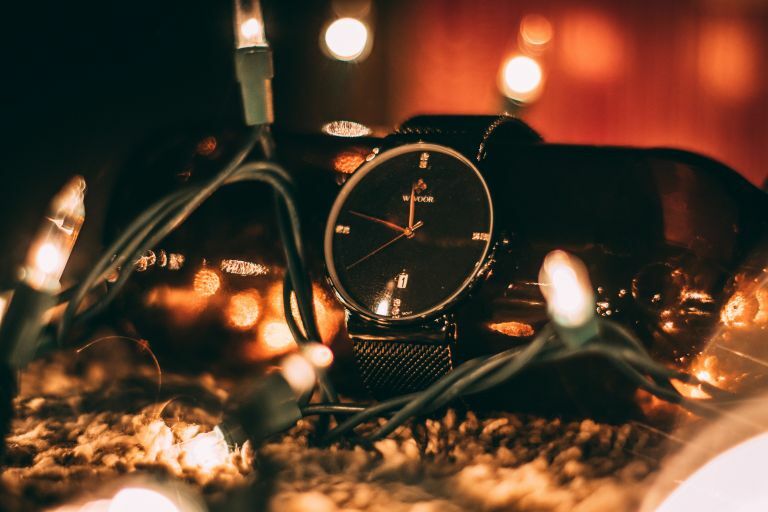 If you’re really looking to spoil someone silly this Christmas, check out our best watch guides below, in which we’ve collated the best wrist candy out there regardless of budget. Stepping away from high-end luxury now and into the realms of gifts for the movie-loving man in your life. If you want to indulge his Marvel obsession without going over the top, or being embarrassed to be seen with him (put the Iron Man onesie down), take a look at these sneakers from Vans. These hi-top canvas shoes come in a range of designs inspired by Marvel superheroes, including this red and navy canvas suede Captain Marvel-inspired design, a red and black leather Deadpool design, and a black canvas/suede Black Panther-inspired pair featuring gold embellishment like that seen of the Golden Jaguar suit in the 2018 film. These shoes can be worn all day thanks to comfort-increasing heel cushioned and padded collars, and they’re built to last with durable, reinforced toe caps. What we love most about these shoes is that while they give a big nod to one of the greatest movie franchises’ of all time, they’re actually incredibly stylish. If you’re also a Marvel fan then it’s a win-win, but if not you can buy a thoughtful gift that shows you know his interests, without having to clutter your home with posters, 3D models or other clutter. For the man who loves DIY, make measuring quick, simple and fun with a digital laser measure. He’ll be able to accurately measure and record precise distances of up to 20 metres inside and out, making short work of measuring up for redecorating or buying or building furniture. It’s really to use as it’s operated with just one button, so it makes short work where a ruler, tape measure and pencil would only lead to frustration and aching arms. The battery life is decent too, lasting for five hours, which is a long time considering he won’t be using this for long stints at a time. This brand new handmade leather messenger bag from Buckle & Seam is the ultimate gift when it comes to practical luxury. The design is sleek and timeless, packing a lot of storage space into a slimline profile so the man in your life will look at the top of his game all the time. The bag features a padded laptop compartment than can hold up to a 15.7” laptop, and a spacious main pocket that will fit a folder, tablet and more. It can be carried using the handle, or a removable shoulder strap for a more casual look. The Midnight Blue collection, which is our favourite by far, is available to pre-order now, with dispatch beginning in early November. Plenty of time for Christmas delivery! Bose have created a portable Bluetooth speaker with lots to shout about in the Soundlink Revolve. There are many reasons why this is a great gift for the tech or music lover in your life. True 360° audio means that he'll get the same high-quality audio wherever he moves in a room, and the combination of robust build, water-resistance and a 12 hour battery life mean he can take it anywhere and be entertained all day long. There's also some built in voice control, enabling him to take hands-free calls and make use of Google Now & Siri. For many, nothing beats a few pints to wind down from a hard day's work. If that sounds like the ideal gift for the man you're buying for, the battery-powered Fizzics Waytap is worth a punt. This simple to use gadget transforms the look, texture and taste of bottled and canned beer into a gloriously smooth drop of draft. Achieving boozy perfection is simple: insert a bottle or can and pull the lever. Soundwaves add Micro-Foam to the bubbles before the Waytap dispenses beer with a fresh, flavoursome twist and a delicious, creamy head. Cheers! Every month, T3 magazine reveals the best tech you never knew you needed to know about, and you can get it direct to your door before each issue hits the stops. It’s filled cover-to-cover with with gadgets that will genuinely make your life better, from TVs that give your favourite movies new life, to smart home gear that saves you time and money, to ways to make your commute more bearable, to cutting-edge new developments. Our relentless focus on quality means we only recommend the creme de la creme, and there’s guaranteed to be something in every issue that will change your world. With lowered prices, you can purchase a gift subscription to T3 today and save up to a staggering 61%. Stylish waterproof jackets are not always easy to come by, but this one from Fjallraven will ensure he looks good whilst staying warm and dry this winter. Made from 65% polyester and 35% cotton, this jacket features layers of durable G-1000 original and lightweight G-1000 Lite fabric. It also has zipped hand and chest pockets, an adjustable hood and is available in blue or green to suit his taste. What's more, if the man you're buying for is eco-conscious, he'll love Fjallraven's ethos. They are committed to using recycled and organic material where possible, and there are Eco versions – made from recycled polyester and organic cotton – of their G-1000 fabrics. Go above and beyond the traditional beard trimmer grooming gift with this ultimate clipper kit from Wahl. In addition to Lithium Ion battery-powered clippers, this kit also includes a personal spotlight trimmer and guide combs in numbers 1 - 8 so he can get exactly the look he wants, scissors for trimming as well as oil and a cleaning brush, all presented in a soft storage pouch. Ergonomic, cordless design makes these clippers a breeze to use, and the small LCD screen displays battery level so he'll always know when its in need of charging. Still looking for more Christmas gift ideas?